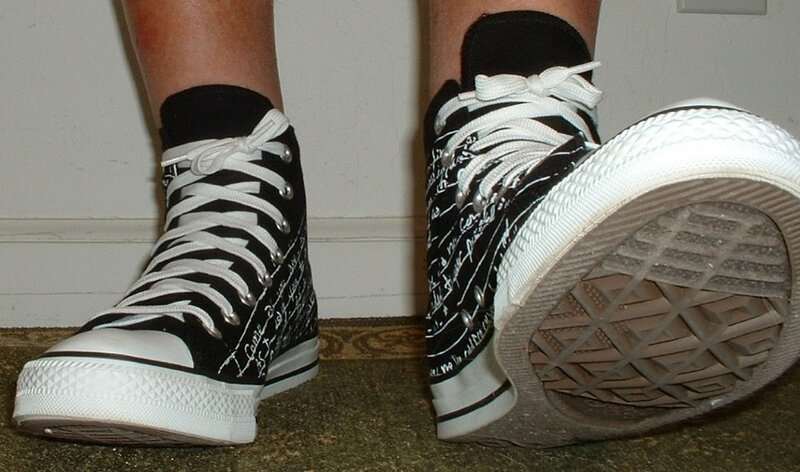 Photo gallery of Kurt Cobain tribute high top chucks. 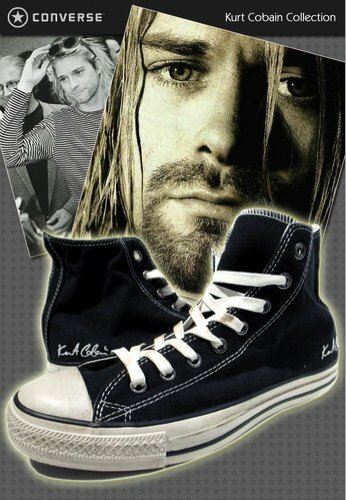 1 Kurt Cobain High Top Chucks Ad for the Kurt Cobain Collection of tribute chucks. 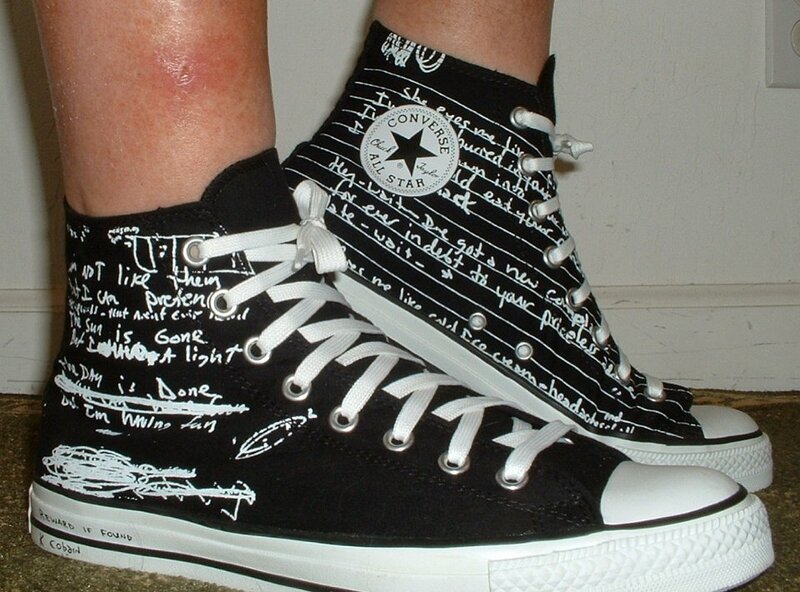 2 Kurt Cobain High Top Chucks Right lyrics high top, inside patch view. 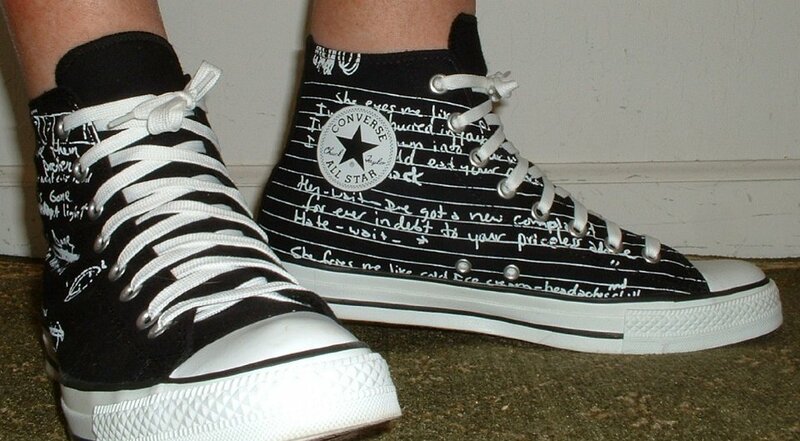 3 Kurt Cobain High Top Chucks Right lyrics high top, outside view. 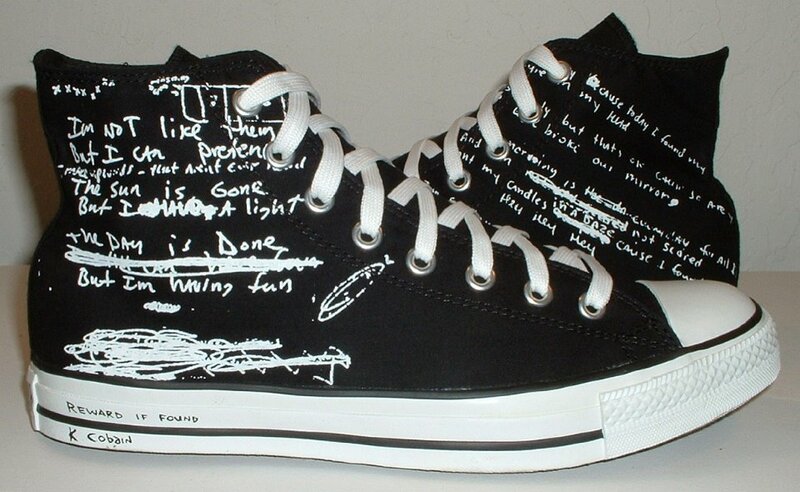 4 Kurt Cobain High Top Chucks Left lyrics high top, outside view. 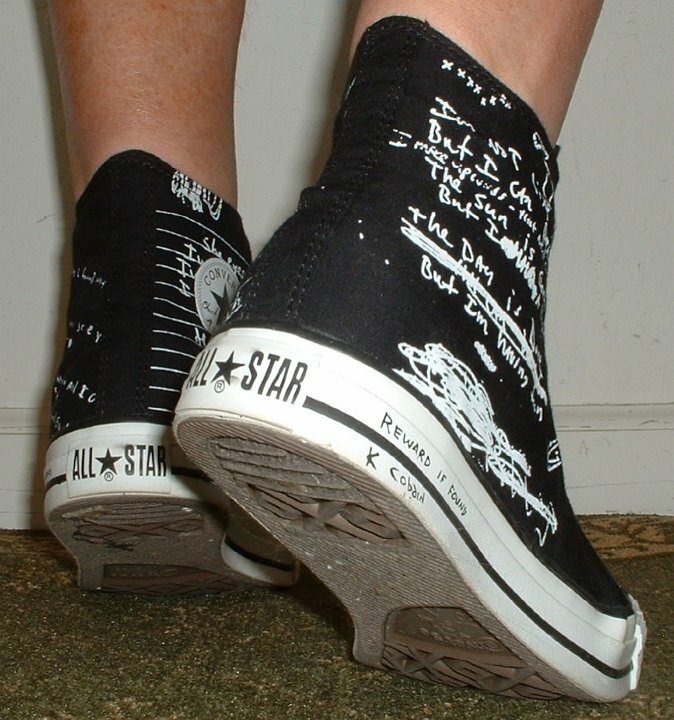 5 Kurt Cobain High Top Chucks Left lyrics high top, inside patch view. 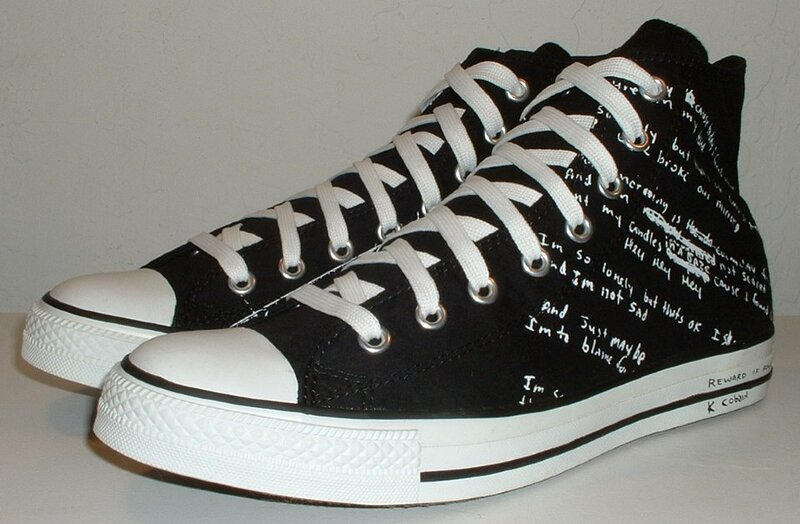 6 Kurt Cobain High Top Chucks Lyrics high tops, rear view. 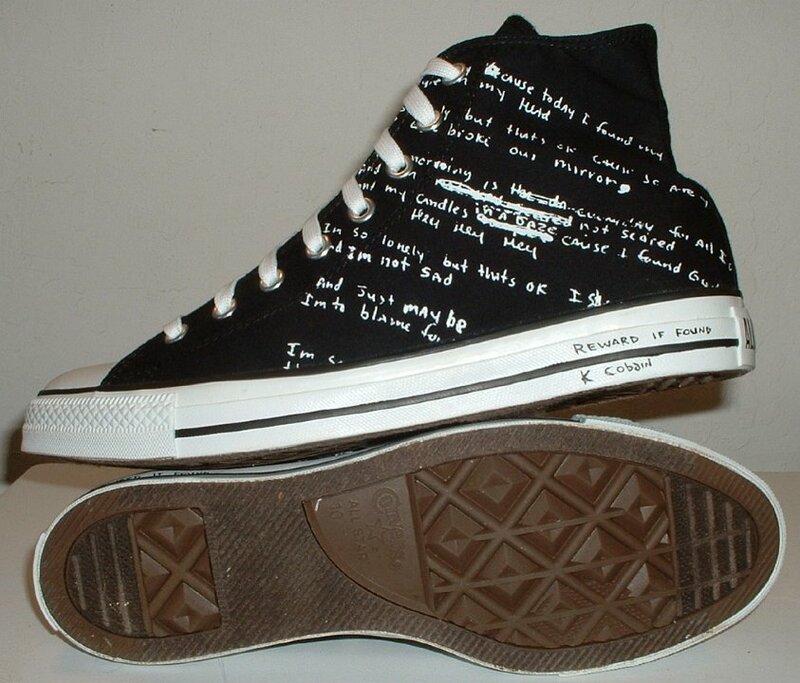 7 Kurt Cobain High Top Chucks Lyrics high tops, angled rear view. 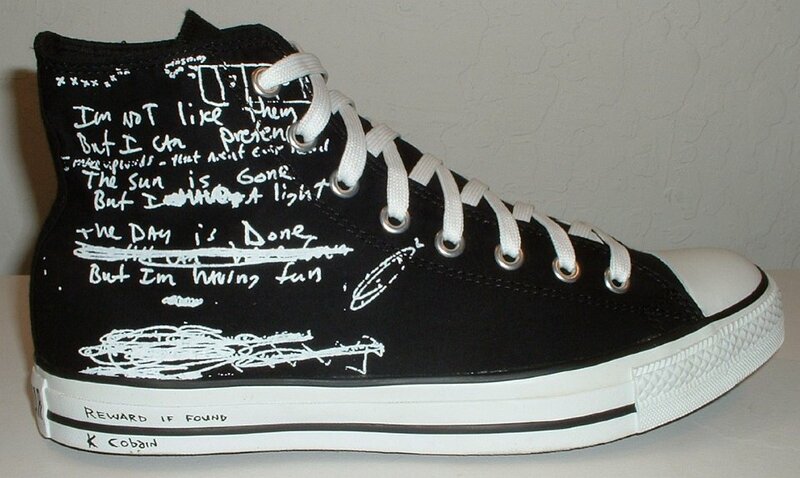 8 Kurt Cobain High Top Chucks Lyrics high tops, angled side view. 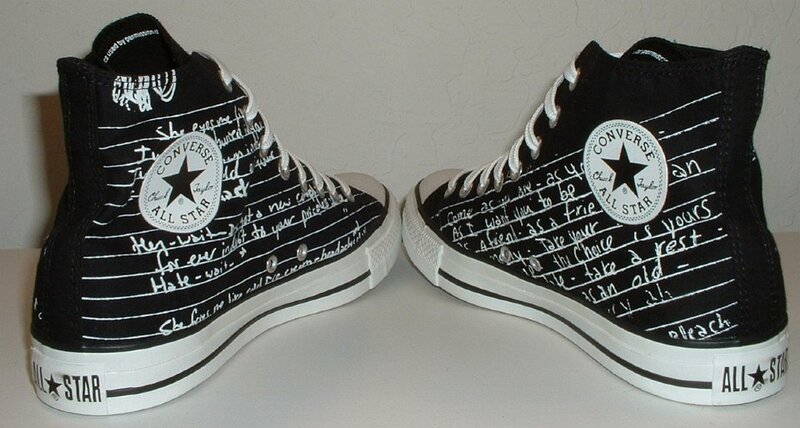 9 Kurt Cobain High Top Chucks Lyrics high tops, front view. 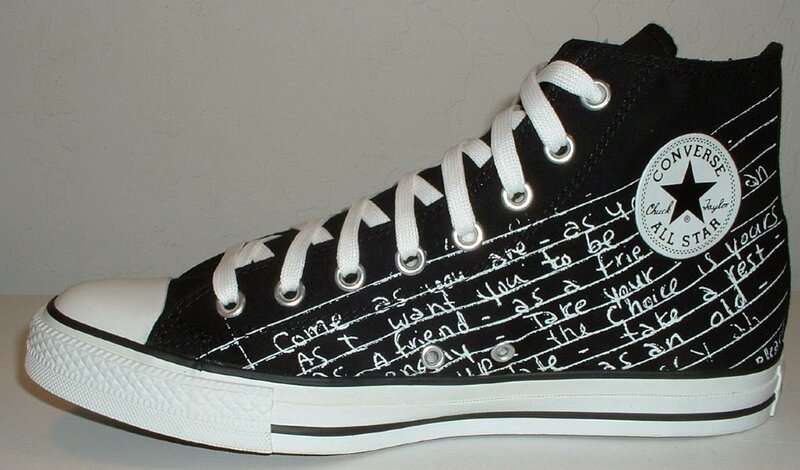 10 Kurt Cobain High Top Chucks Lyrics high tops, angled front view. 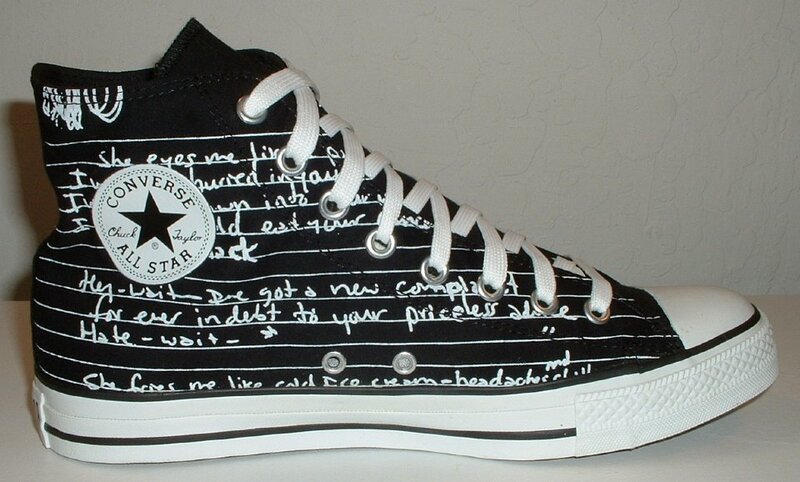 11 Kurt Cobain High Top Chucks Lyrics high tops, top view. 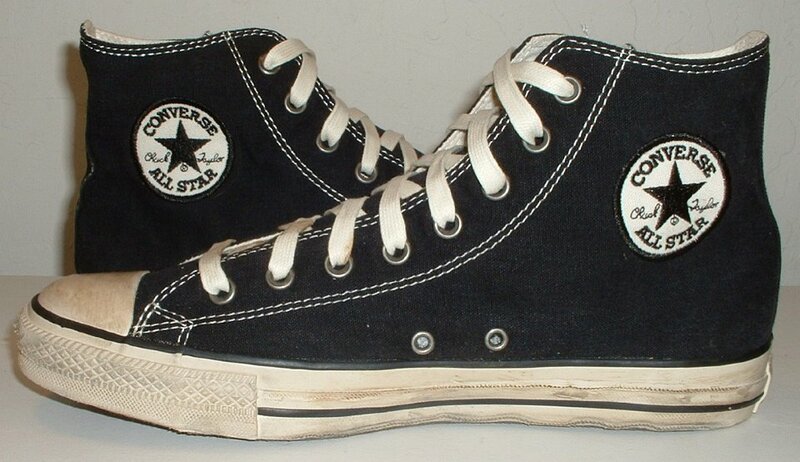 12 Kurt Cobain High Top Chucks Lyrics high tops, insdie patch views. 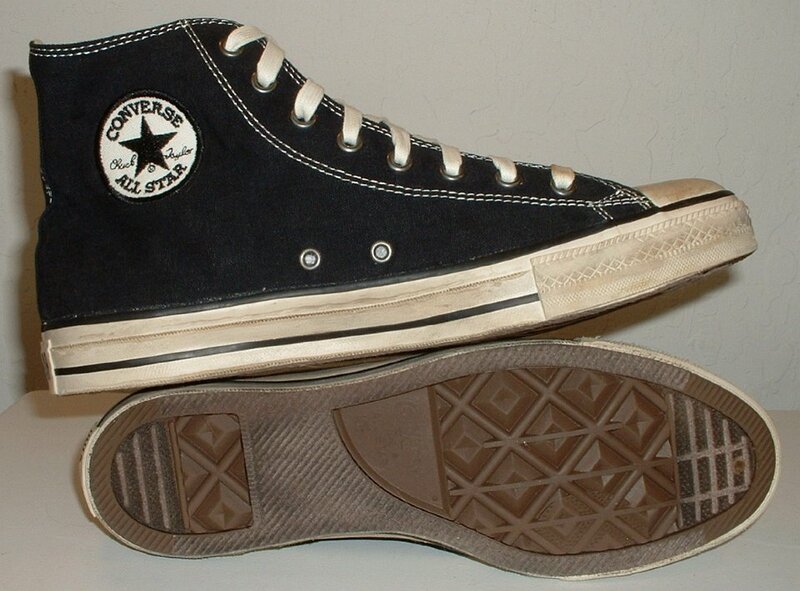 13 Kurt Cobain High Top Chucks Lyrics high tops, outside views. 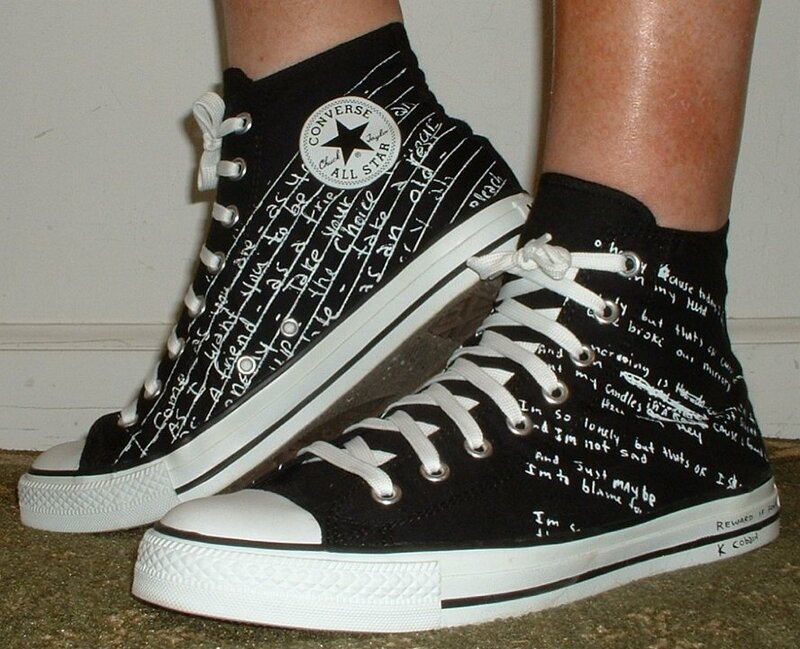 14 Kurt Cobain High Top Chucks Lyrics high tops, outside and sole views. 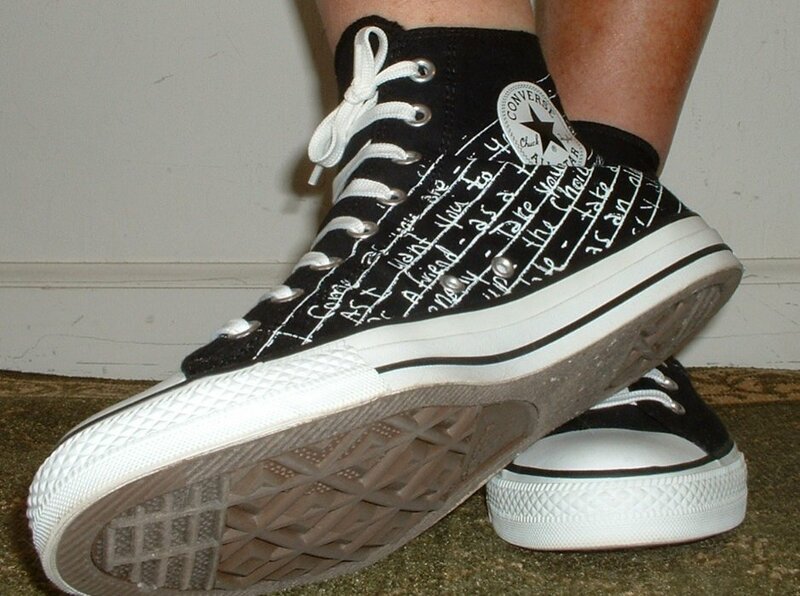 15 Kurt Cobain High Top Chucks Lyrics high tops, inner sole closeup. 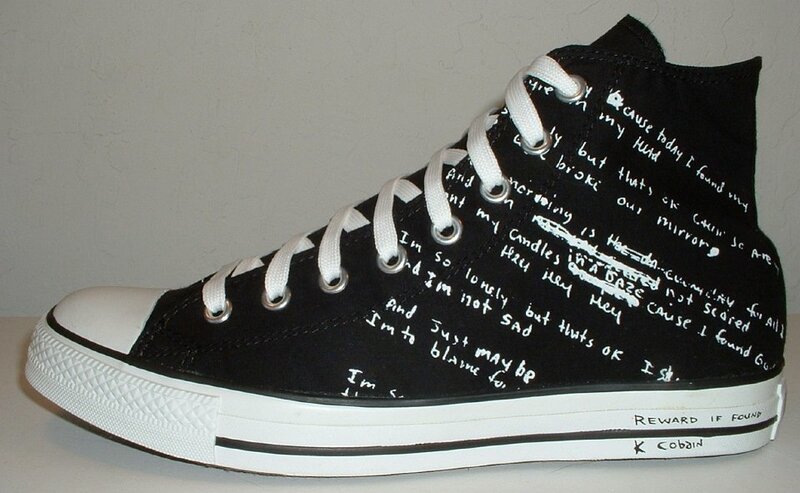 16 Kurt Cobain High Top Chucks Lyrics high tops, outside and angled side views. 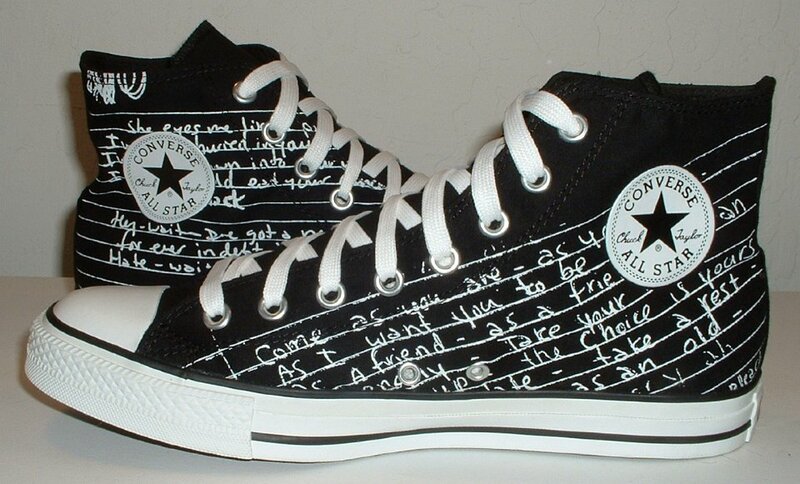 17 Kurt Cobain High Top Chucks Lyrics high tops with box. 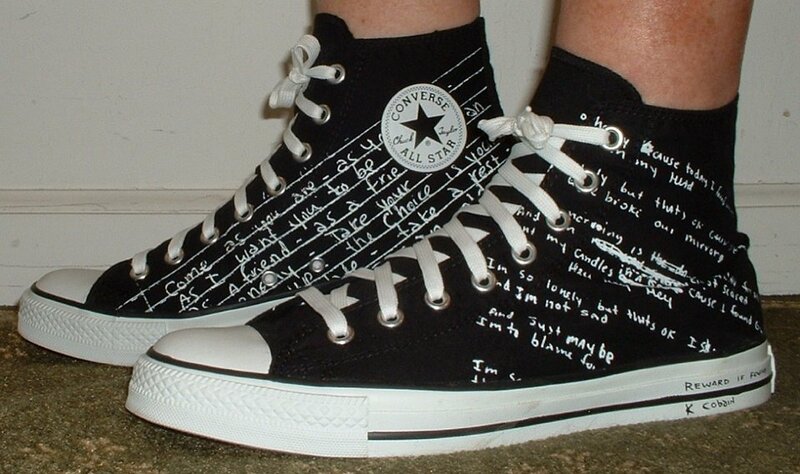 18 Kurt Cobain High Top Chucks Lyrics high tops with box. 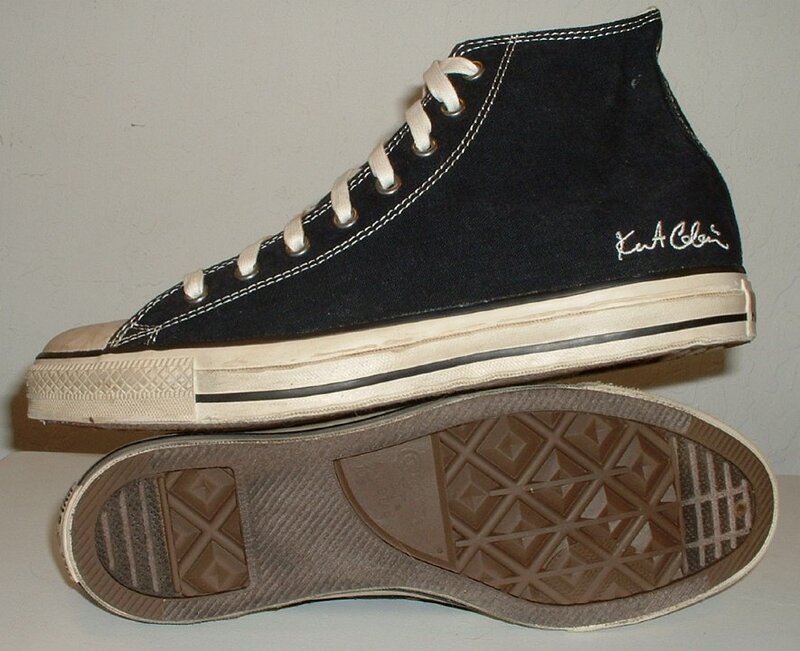 19 Kurt Cobain High Top Chucks Right signature high top, outside view. 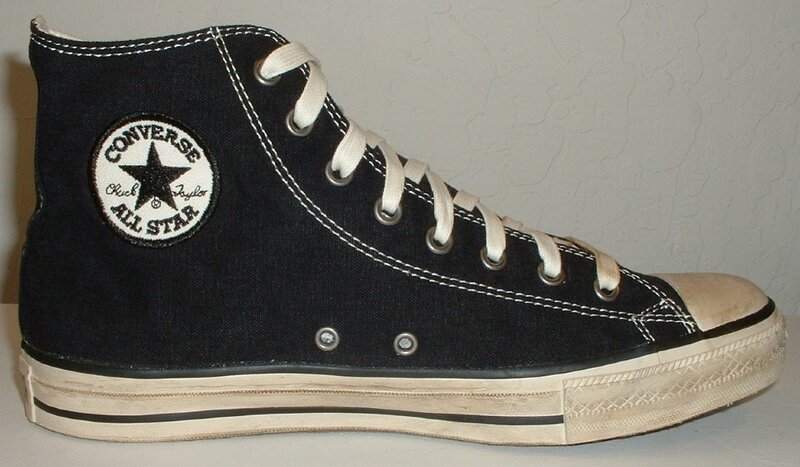 20 Kurt Cobain High Top Chucks Left signature high top, inside patch view. 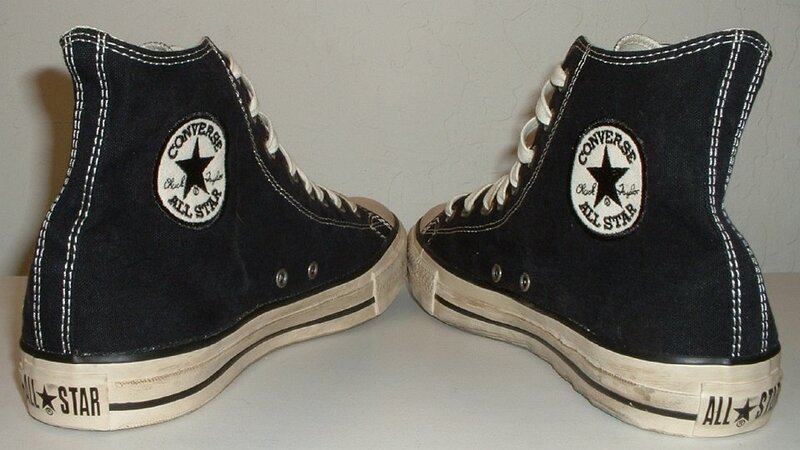 21 Kurt Cobain High Top Chucks Left signature high top, outside view. 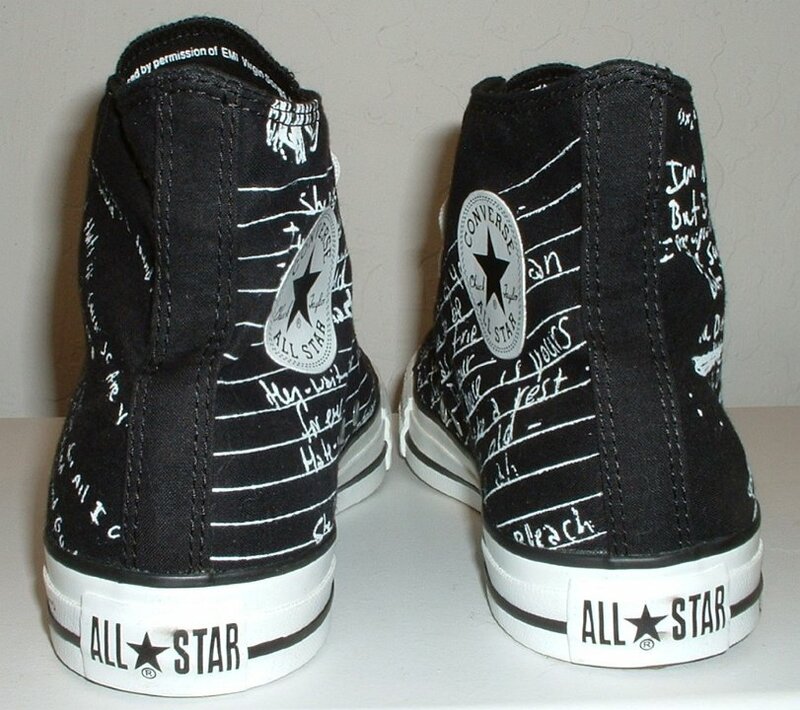 22 Kurt Cobain High Top Chucks Signature high tops, rear view. 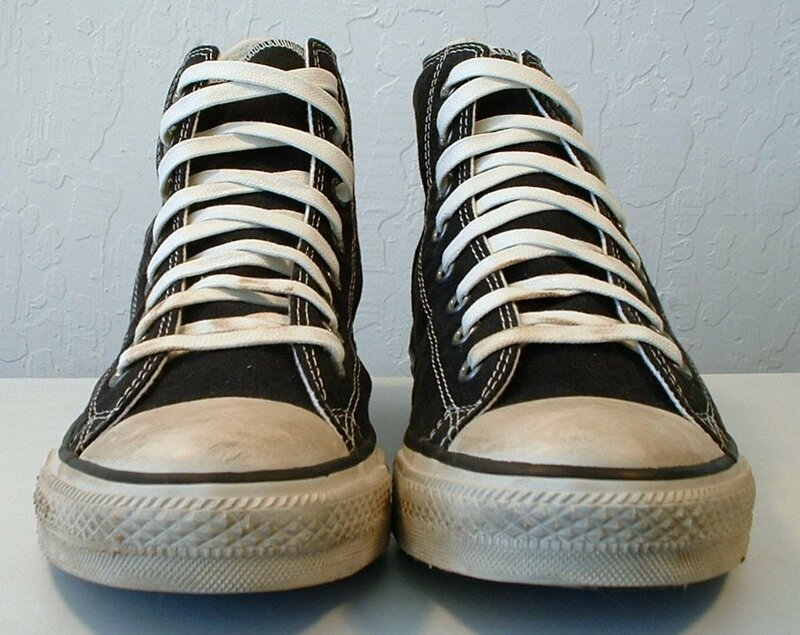 23 Kurt Cobain High Top Chucks Signature high tops, angled rear view. 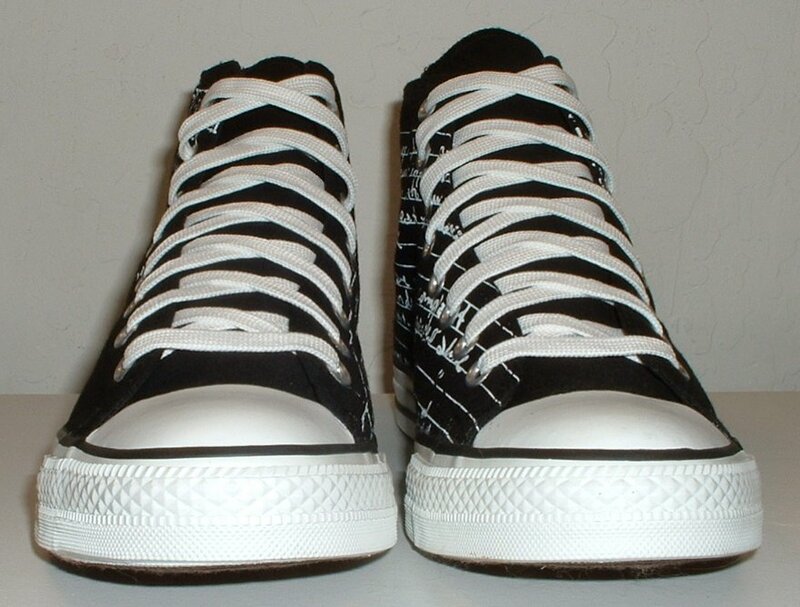 24 Kurt Cobain High Top Chucks Signature high tops, angled side view. 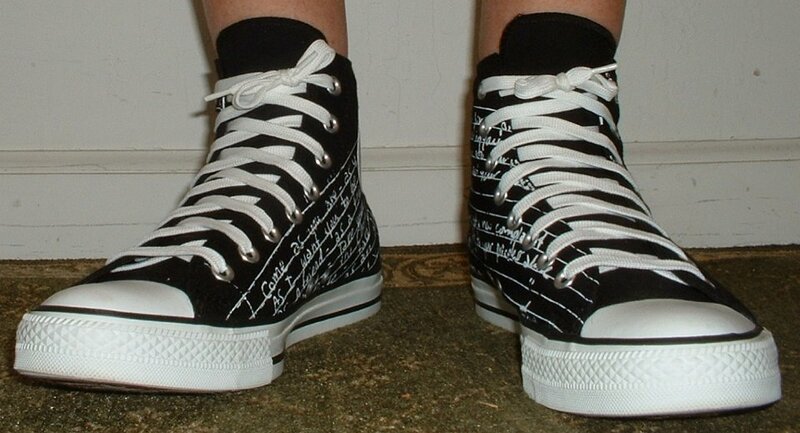 25 Kurt Cobain High Top Chucks Signature high tops, front view. 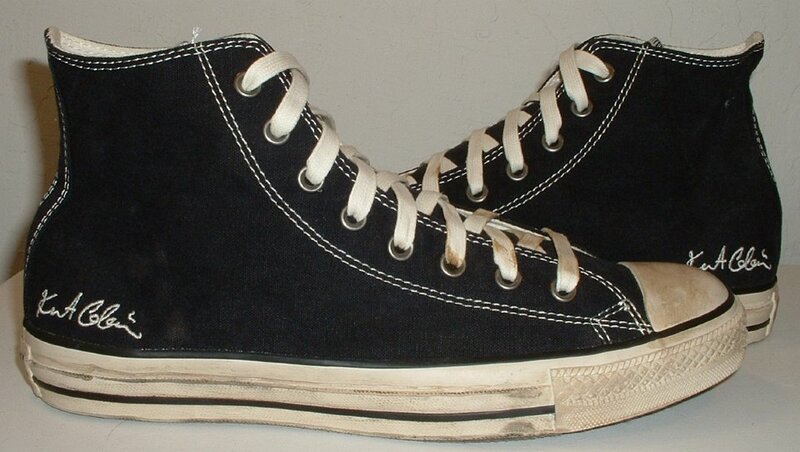 26 Kurt Cobain High Top Chucks Signature high tops, angled front view. 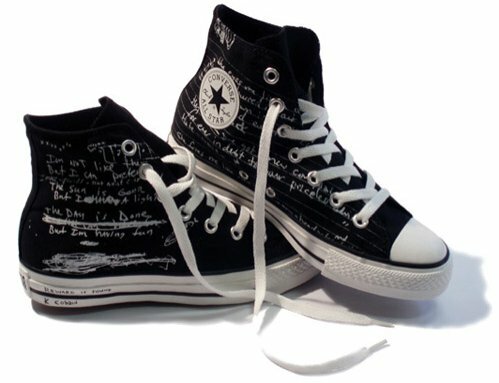 27 Kurt Cobain High Top Chucks Signature high tops, top view. 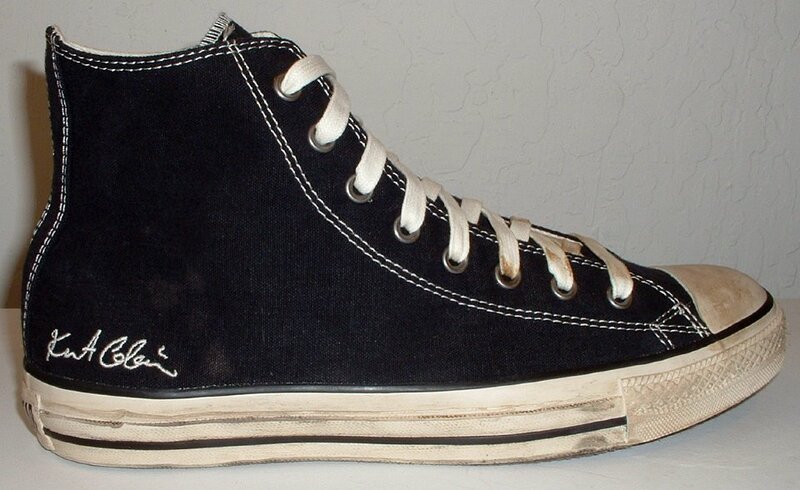 31 Kurt Cobain High Top Chucks Signature high tops, outside and sole views. 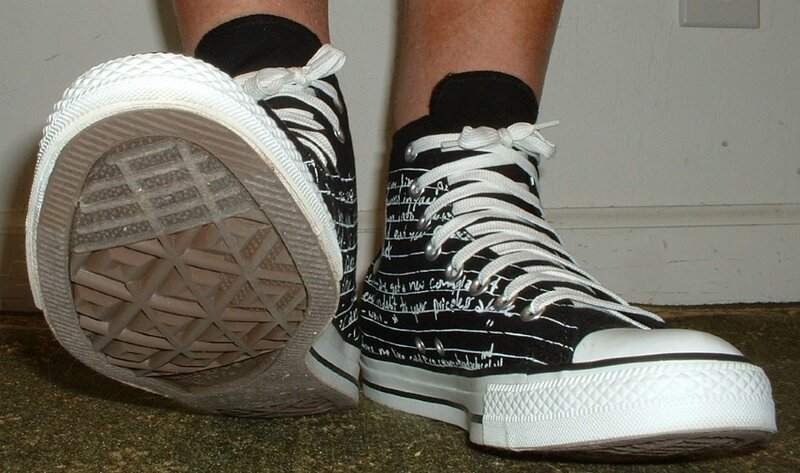 32 Kurt Cobain High Top Chucks Signature high tops, inner sole view. 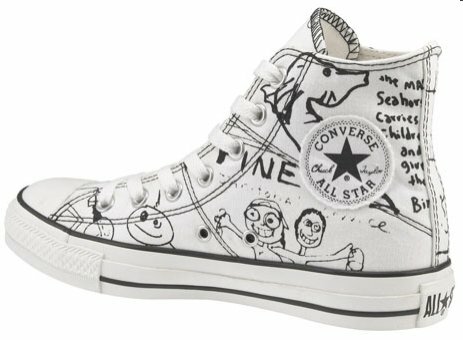 46 Kurt Cobain High Top Chucks Right white doodles high, outside view. 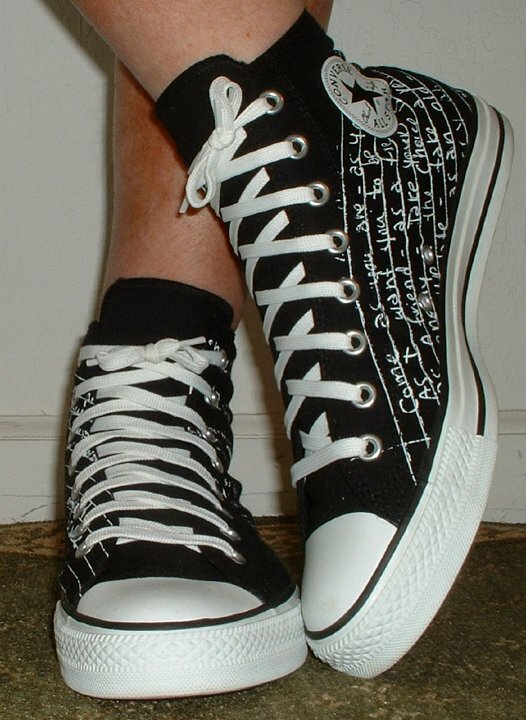 47 Kurt Cobain High Top Chucks Left white doodles high, outside view. 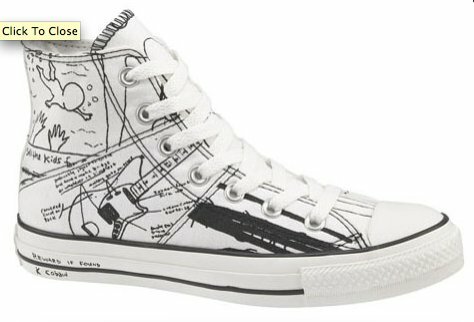 48 Kurt Cobain High Top Chucks Right white doodles high, inside patch view. 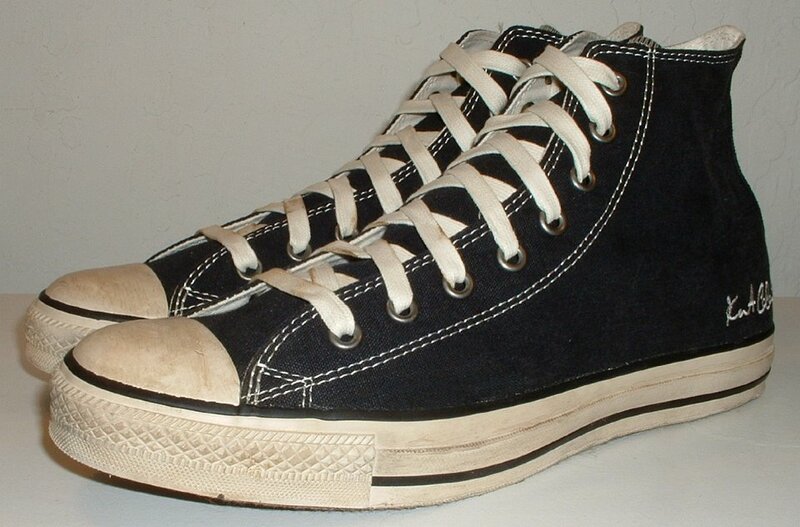 49 Kurt Cobain High Top Chucks Right white doodles high, iangled side view. 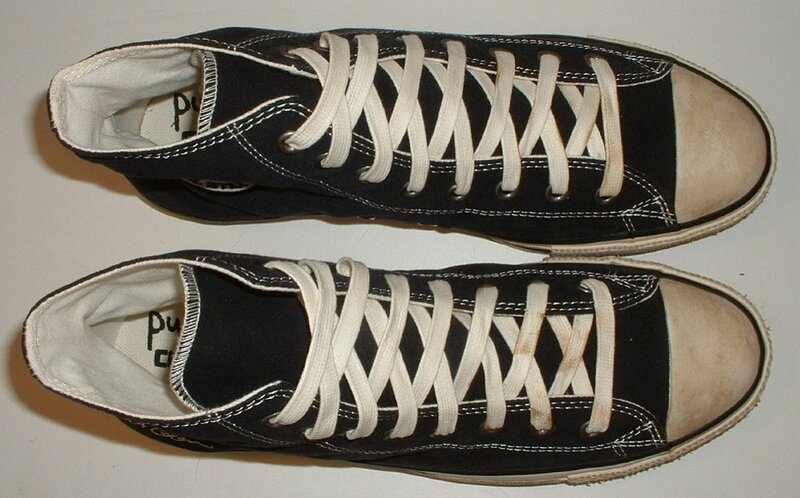 50 Kurt Cobain High Top Chucks Wearing white doodles high tops, side view. 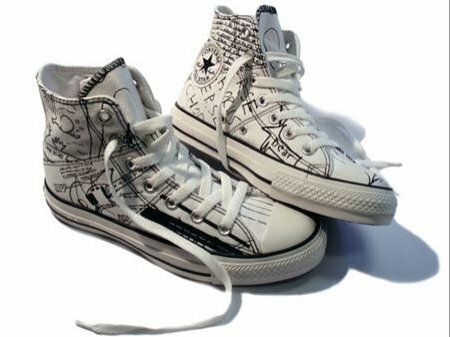 Converse issued this 2008 line of high tops in tribute to rock star Kurt Cobain as part of their century series of chucks. 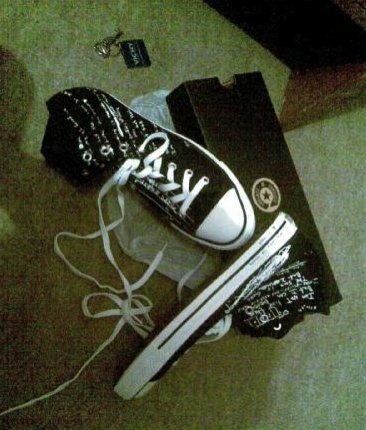 The shoes come with special tags. 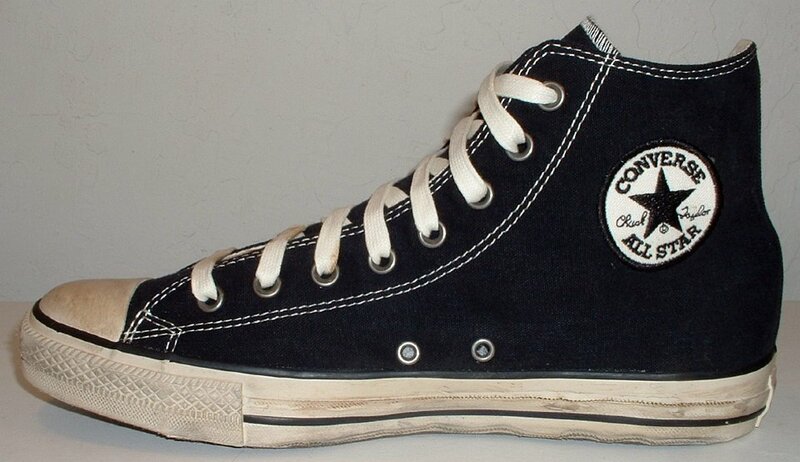 There is a circular tag that identifies the series as part of their Rock & Roll originals. 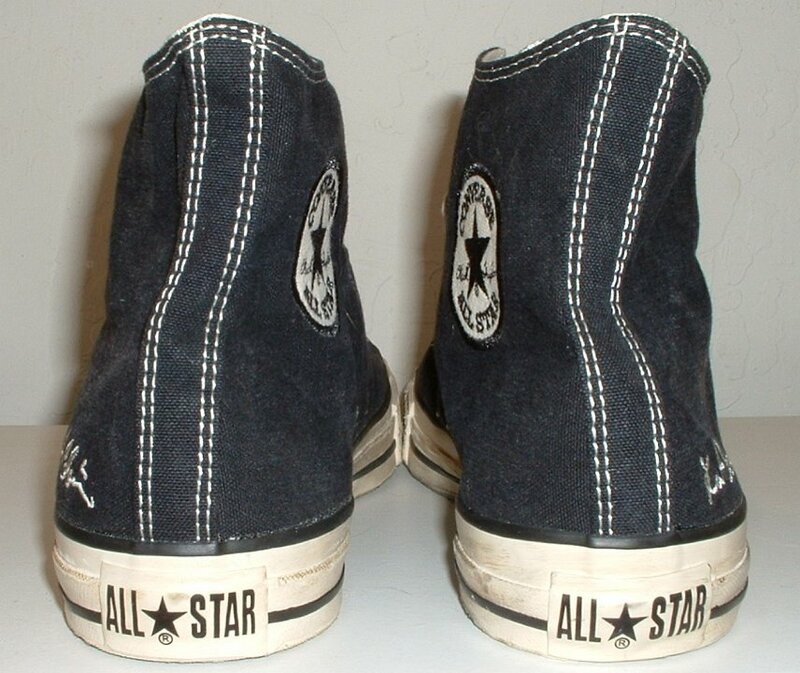 A second tag describes Cobain this way: "He haunted Seattle's music scene, withdrawing into its grit and grime. He thought some of it made sense, but most of it didn't. 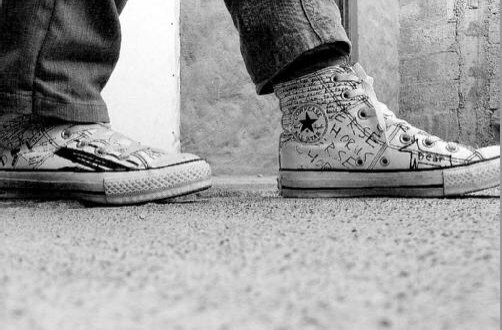 So he turned to the only thing he knew for sure: his own music. 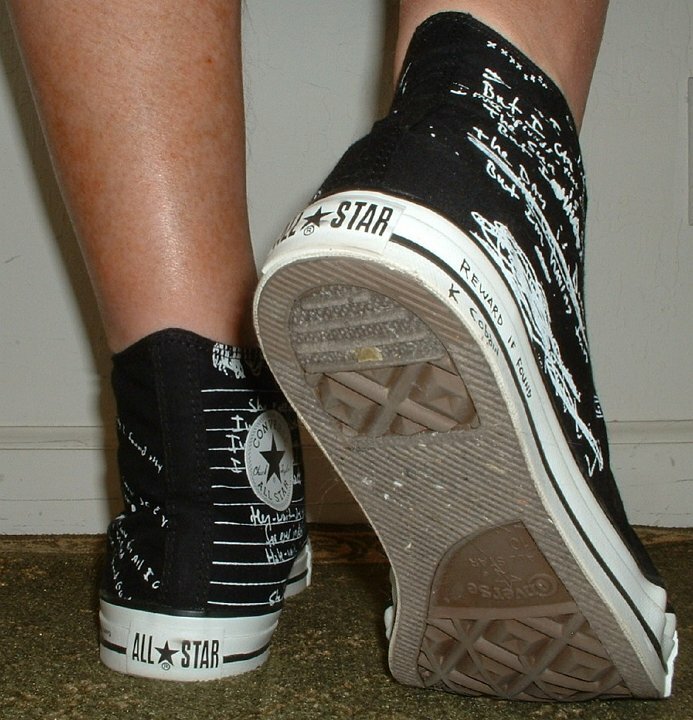 Soon it became clear: the inspired songwriter with the scruffy hair and stormy eyes had taken the underground grunge movement mainstream." 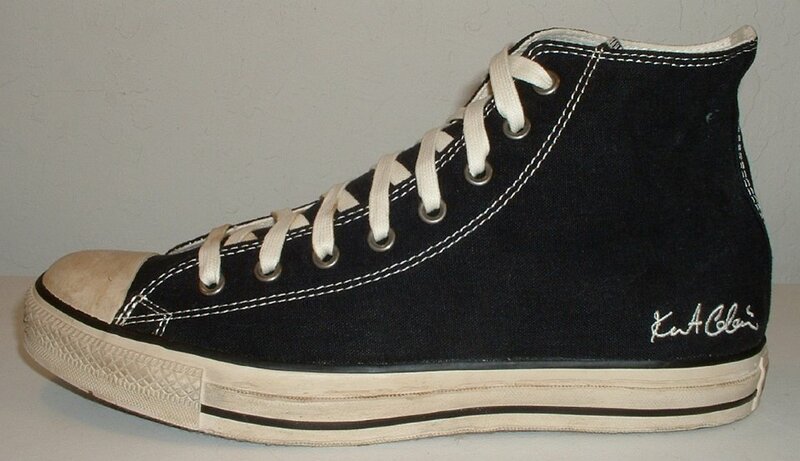 There are three high top models: the Signature which has an embroidered signature on the outside uppers, a fabric ankle patch, and preworn look on the rubber foxing and toe cap. 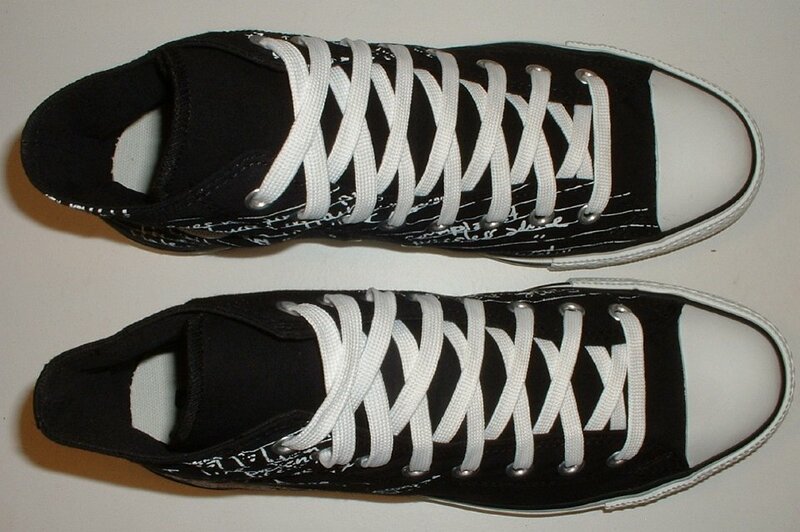 The laces also have a worn look, and are more like the original Converse laces. 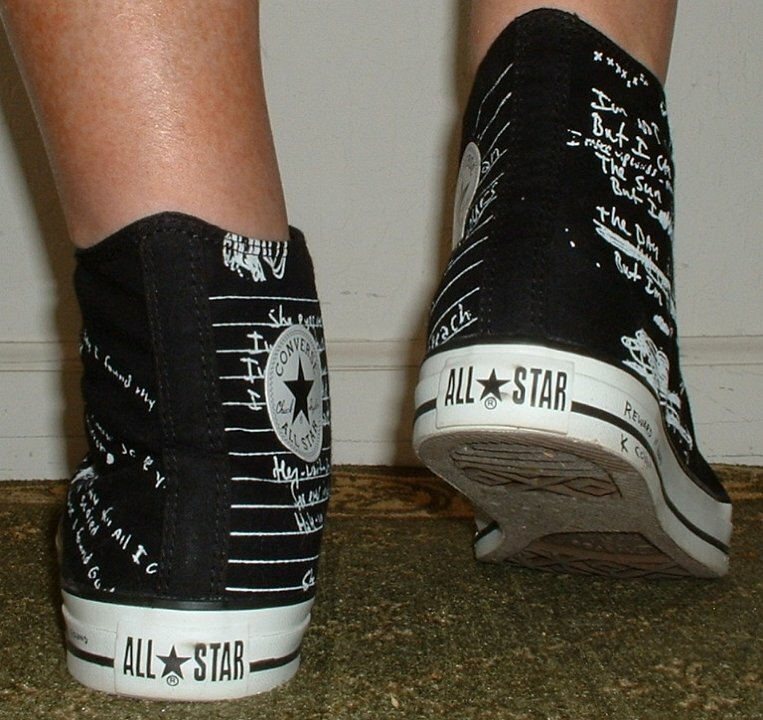 The insole has the slogan "punk rock means freedom." 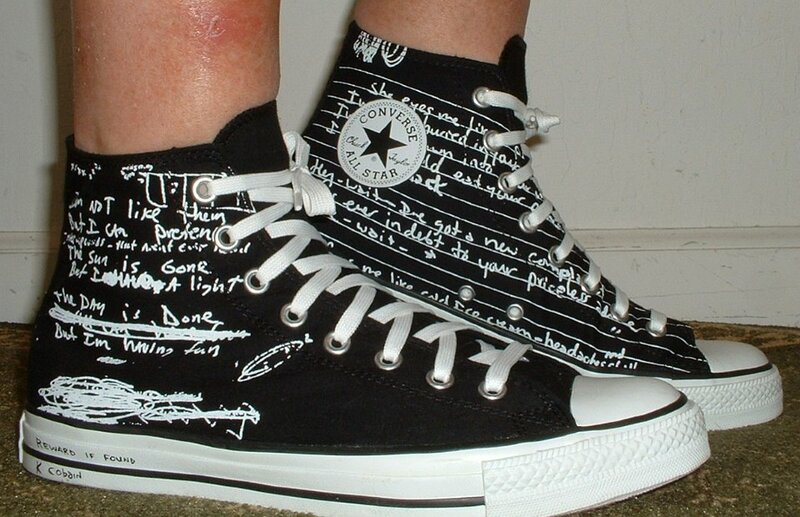 The Lyrics model is traditional black and white, and has excepts from different songs printed on the canvas uppers and on the inner soles. One other cool feature is writing on the inside of the white wrap — "Reward if found. 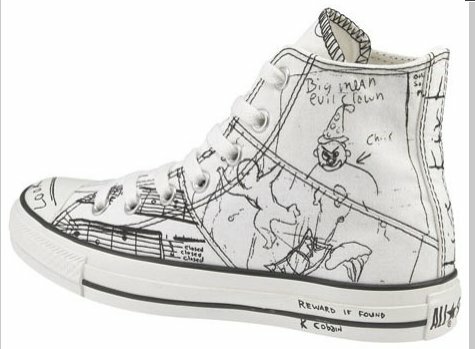 K. Cobain" The white Doodles model has different sketches from Cobain's notebooks, and the same reward inscription on the white outside wrap.